Next Wednesday, April 25th, is National DNA Day — celebrating two of the most important milestones in the history of human genomic research. 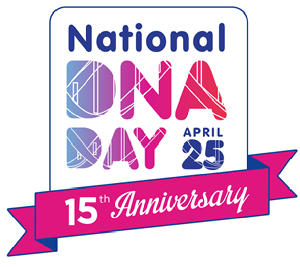 But whether we should have celebrated earlier this month or back in February or waited until next week or even next February, one thing we’re all in time for: a National DNA Day celebration sale on DNA tests offered by all of the major DNA companies. • AncestryDNA: Its autosomal DNA test is on sale for $59.00. Good through April 29, excludes tax and shipping. Check your country-specific websites for prices outside of the United States. • Family Tree DNA: All of its tests — autosomal, YDNA and mitochondrial DNA (mtDNA) are on sale through April 28. • The autosomal Family Finder test sale price is $49. • The full mitochondrial DNA (mtDNA) sequence, to investigate your direct maternal line (your mother’s mother’s mother, etc. ), is on sale for $149. • YDNA tests — to investigate your direct paternal line (your father’s father’s father, etc.) — are on sale, with prices depending on the number of markers chosen. The Y-37 test is sale priced at $139; the Y-67 is $209; the Y-111 is $289; and the expert-level Big Y-500 is $649. Check your email for a coupon code on the Big Y test if you’ve already tested to the Y111 level. • Multiple test bundles are on sale for more savings. The Family Finder + Y-37 bundle is sale-priced at $179. The Family Finder + Y-67 bundle is $249. The Family Finder + mtFull Sequence bundle is $189. The Family Finder + Y-67 + mtFull Sequence bundle is $398. • MyHeritageDNA: Its autosomal test is on sale for $69. Good through April 25, excludes shipping. Uploading of test data from other companies is still free at MyHeritage. • 23andMe: Its autosomal tests are on sale, with the ancestry-only test down to $69 and the ancestry-and-health option down to $139. Good through April 25, excludes shipping. • LivingDNA: Its test, which doesn’t yet offer matching but does provide autosomal, YDNA and nmtDNA data, is on sale for $79.99. Good through April 25th, excludes shipping. As a laboratory tech in my working days, thanks for mentioning Rosalind Franklin! Is it just me who can’t make the living DNA links work? The link works for me. Just checked it. Judy, based on your experience of seeing such sales come and go over the years, would you recommend taking advantage of the current Big Y+500 + Y111 sale for a kit with an existing Y37 test? If not, what, if anything, would you recommend at this time? Thank you! This has to be an “it depends” answer. If you are overwhelmed by matches at the Y37 level (you’re a Smith, for example, and you match 450 other Smiths and other surnamed folks in the R haplogroup), then expanding the number of markers can help narrow down the specific line. But going from 37 to Y-500 is an awfully big jump to start with. You can often narrow things greatly by going from Y-37 to Y-67 and then maybe to Y-111. Example: a cousin of mine has 81 matches at Y-37, and going to Y-67 narrowed that to 28 — a more manageable number. Another cousin has only 13 matched at Y-37 — even going to Y-67 isn’t really necessary for him and going to Y-500 would be overkill in a BIG way.